WASHINGTON (Jan. 12, 2010) -- Soldiers and others can now read the latest Army news on their iPhones, thanks to a new application by the team that developed the Army's Web site, www.Army.mil. The new iPhone application was launched in December, and is available for free from the iTunes application store or by visiting the Army.Mil Mobile site. Soldiers and others can now read the latest Army news on their iPhones, thanks to a new application by the team that developed the Army's Web site, www.Army.mil. "The Army developed the iPhone application to put U.S. Army stories, images and videos in the hand of users," said Patricia Downs, deputy director of the Army's Online and Social Media Division. "It allows Soldiers and their family members to save their favorite content and to share it over Facebook, Twitter and e-mail. The application also offers several entertainment and informational sections." The application provides users the latest Army news headlines from around the globe, and allows readers to choose which news feeds they want to receive, including those from Europe, Asia, Africa, and the Pacific, as well as news concerning health issues, Army science and technology, the Army National Guard and Army Reserve and news headlines from the Army News Service in Washington, D.C.
Also available on the iPhone is the daily "Stand-To!" This is a daily compendium of news, information and context for Army leaders. In addition, a complete archive of Soldiers magazine, as far back as 2002, is available through the iPhone application. The iPhone's wide screen and multimedia capabilities don't go to waste just reading text either. The new application provides access to both Army video and still imagery, including content hosted on the Army's Flickr feed and YouTube page. And for those who want to relive the greatest moments of Soldiers Radio News, podcasts of the show are also available through the application. Social media is at the heart of the new Army.mil, which was revealed in early December. 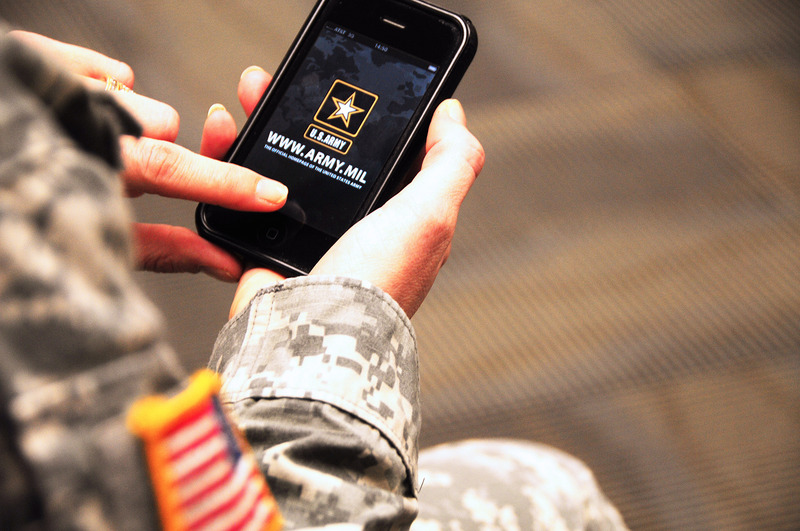 The emphasis on social media carries over to the Army's portable application as well. Users of the iPhone app have access to the Army Live Blog, Twitter feed, and Facebook page. The application also serves as a digital pocket almanac and includes information about Army uniforms, military rank, Army weapons systems and even the words and music for the Army song. And for those interested enough in the Army to have the application on their iPhone, but not yet wearing the uniform, the new application can even help users find a local recruiter. "I would have to say that the most exciting feature offered on the Army app is the 'Find A Recruiter' section," Downs said. "Just enter your zip code in the app and it will then bring up a recruiting station in your area instantaneously. It's as simple as that." Since the application's launch in late December, it has been downloaded more than 20,000 times, and remains in the top 25 of free news applications, Downs said.